Usually when someone has a birthday they receive gifts, but Canada, generous country that she is, is not one for that selfish tradition. Instead to mark its 150th birthday, Canada is giving away its locks and parks. 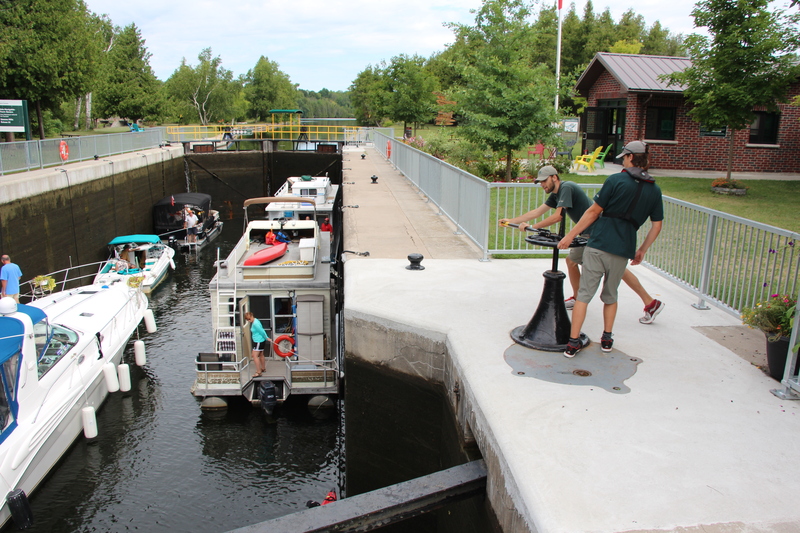 More accurately, waiving park fees at Parks Canada locations and waiving lock fees at its canals, including the Trent-Severn National Historic Waterway. The Trent-Severn stretches 386 kilometres long, weaving its way across central Ontario from Trenton on Lake Ontario to Port Severn on Lake Huron. Mooring at the lock walls isn’t free, but it’s $0.90 per foot, per night or $9.80 per foot for the whole season (all prices in Canadian dollars). In other words, if you’re going to spend 11 combined nights throughout the season moored you’re better to get the season rate. It also means you can cruise leisurely through the 45 locks in any direction. Usually it’s just larger cruisers or houseboats that spend multiple days exploring, but that’s not for everyone. To prove you can explore the Trent, or sections thereof, over the course of many days in any boat I recruited a friend, borrowed a Princecraft Quorum 23 SE pontoon and punched in the GPS coordinates for Lakefield. If you can’t stay on your boat, where do you sleep? The answer is a simple one, though with a more complicated name: oTENTik. 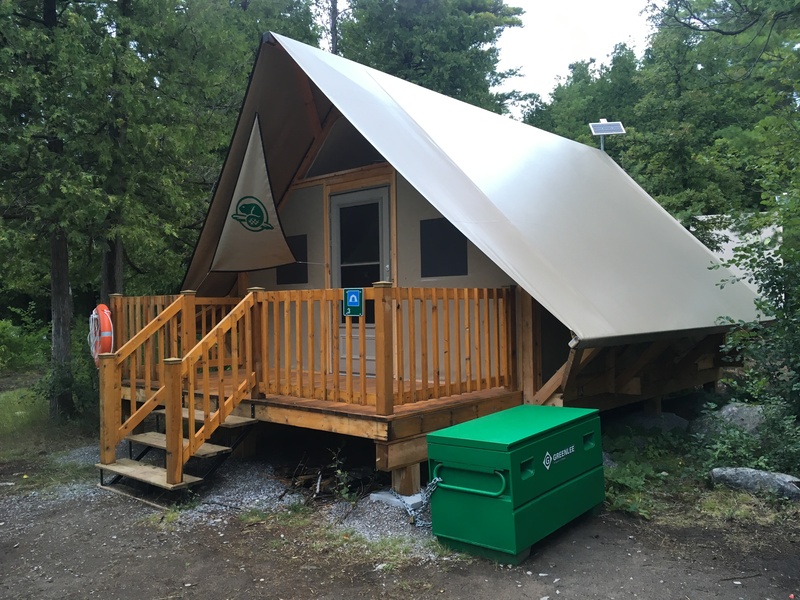 It’s a half-cabin/half-tent set-up and there are two locations on the Trent, one at Lock 24 and one at Lock 35. Lock 24—Douro—is a serene spot close to Peterborough, but far enough away that you’re out in the quiet wilderness. Most of the oTENTiks are on the small island between the dam and lock. There are beds, a table and chairs inside. No running water or power, but a solar panel powers a light and a USB charger so your phone—aka alarm clock and camera—will be charged up. Your site includes a BBQ and picnic table as well as fire pit in most places and, worth noting, the shared washroom facilities at the lock building are some of the cleanest I’ve seen in my years of boating. After spending a night having an all-bragging-rights-on-the-line fishing derby from the shore (that I lost), we prepped our pontoon as Chad Buchner of Parks Canada met us for a tour southward. Overall, it’s fairly standard procedure, and the lock staff will guide you through as you enter. Of course I had to ask if that had ever happened. And yes, yes it has. Don’t be that guy! Otherwise, though, he doesn’t expect the traffic to be overwhelming and explained that the current usage is way down from the peak in the 1980s. The lock staff only had half-dozen lockages to deal with the day we had arrived so there is plenty of for more boats without straining the system or without making you wait forever at the locks. Of course the Trent isn’t the only Parks Canada waterway, the free lockage is good on the Rideau Canal and the Quebec Canals, too, including the Lachine Canal. Trailering your boat over for a free exploration is definitely an adventure worth doing. A lot of people get it in their mind that the Trent-Severn is merely a thoroughfare and is an all-or-none proposition like the Welland Canada (which is not operated by Parks Canada and not included in the free lockage program). That’s not the case at all. You can spend all summer on one section if you want. The Trent-Severn is called a waterway, not a canal or river, for a reason. There are some man-made narrow sections and there are some river sections too. There are also entire lakes that are a part of the system, including large lakes like Simcoe and the Kawarthas and medium lakes like Rice lake, south of Peterborough. It’s popular with people doing the Great Loop and you’ll see a fair number of American boats in the summer. We cruised past a big trawler with South Carolina registration markings. The locks are where engineering and history are most evident. The lock immediately north of Peterborough is well over a century old, for example. And as Buchner explained, the walls you float past, as you head up or down the lock are the original concrete walls that were installed back in 1898. It could and it means the gem in the Trent crown is still standing and running almost exactly as it was when it first opened in 1904. 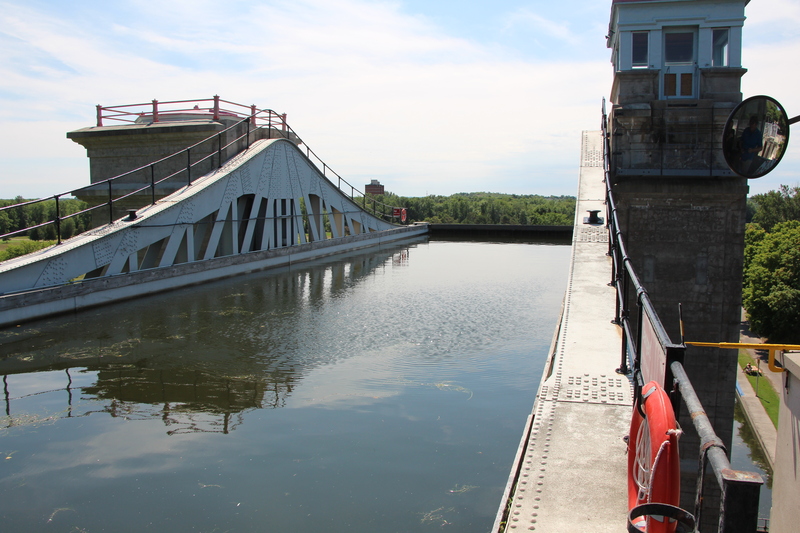 The Peterborough Lift Lock remains the highest hydraulic lift lock in the world with a drop of 65 feet. It’s so unique there are cruises just to take you up and down on it that are quite popular in peak season. And it’s fast too—only 90 seconds! Speed is exactly why this was built. It was this or flight locks and an hour or so of travel time. 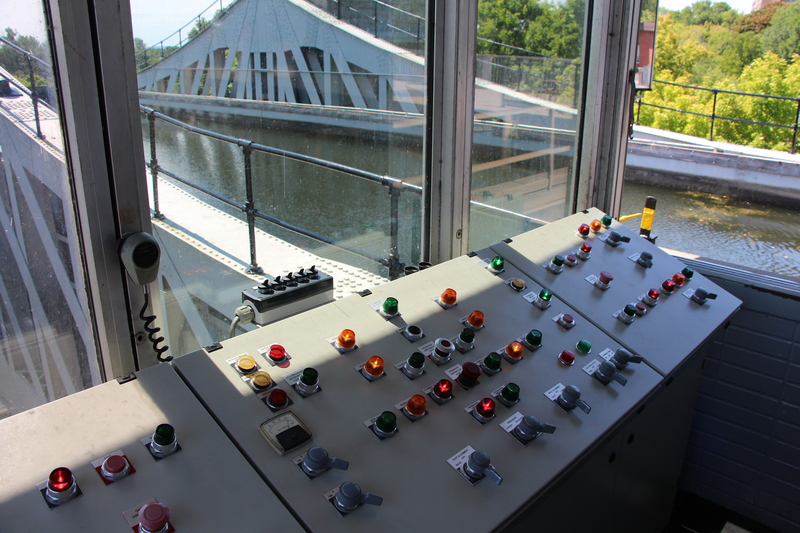 “On a busy day there can be 25 to 30 lockages,” explained lift lock operator Kathleen Lang as she showed me the multi-buttoned control board that runs the lock from the centre tower. Other than upgrading from manual locks and valves to hydraulic in the 1960s everything else is the same. The rivets and steel on the chambers are even original. At the bottom, the chamber has seven feet of water but at the top it has eight feet. That extra foot water, weighing 144 tons, harnesses gravity to push the top chamber down, shoving water through a pipe which fills up the reservoir under the opposite shaft pushing it and the lighter chamber upwards. We were given an exclusive tour underneath and inside the lock that you can find online at PowerBoatTV.com, but suffice it to say this is an engineering marvel that you’ve got to see. Continuing south out of the lift lock you’ll be cruising through a man-made canal that was cut through what used to be farmer’s fields. Now it’s straddled by a golf course, the lift lock visitor’s centre and parkland and some homes. There’s also a rail swing bridge here that is still in use and the railway has priority, so while the bridge remains open, if a train is scheduled to come by, they close the bridge and boaters have to wait. In fact, that happened mere minutes after we passed it. There are also a few road swing bridges you’ll encounter which are generally closed for traffic to use but when you approach slowly the staff see you and will swing things into action. Right in Peterborough, Lock 20 connects the canal to Little Lake and is quite busy since it bisects the walking path and park. The gate here is widened to allow easier access for bikes, strollers and wheelchairs, but otherwise it’s the same set-up as the majority of the locks. At this lock we were able to give the lock operation a go. It includes about 12 rotations of a surprisingly difficult-to-turn wheel. Not impossible, but it’s not hydraulically assisted. The Trent-Severn Workout Plan is what Buchner affectionately called it. Speaking of mooring at lock walls, this is one to put on your list. The walls on the lake side have a great tie-up spot. You’ve got the beauty of the park, but are far enough from the path for some peace and quiet. Best of all, from here you have a great view of the fountain and fireworks that are set off during certain dates in the summer. Check the city’s website for the specifics. Another option in Peterborough is to head to the marina. If you have a cruiser, you’re set, but if you’re on a pontoon or another day boat there is a hotel along the water, a short walk away from the marina where you can stay. 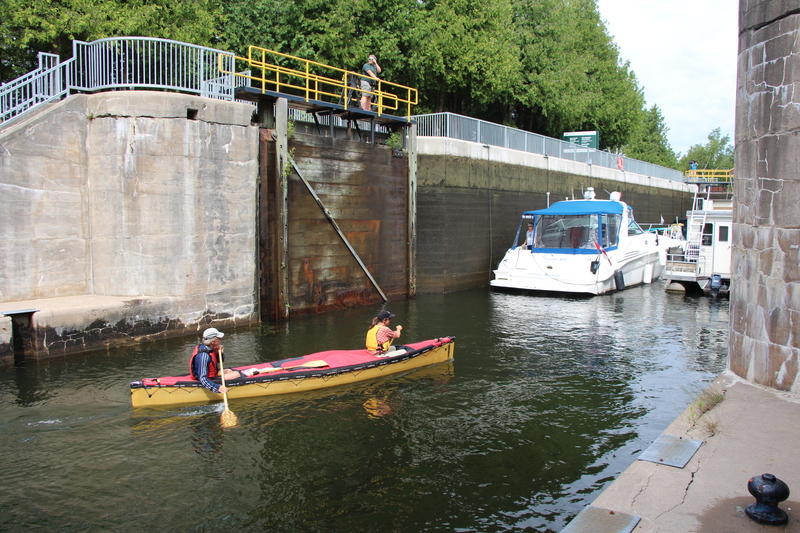 If you continue through Little Lake and Lock 19 into Rice Lake, the biggest body of water between Peterborough and Lake Ontario, you have a 60-kilometre (37-mile) lock-free stretch of boating until you get to Hastings. Hastings, itself, is another good jumping off point for day trips as the marina here has a free launch ramp and good facilities. While we happened to pick this stretch it doesn’t mean it’s the best stretch or where you should go. The waterway is your wonderland this summer and you can go wherever you want! Some other neat spots, along with the oTENTiks at Lock 35, include the Kirkfield Lift Lock—it’s only a few years younger than Peterborough’s and not quite as high, but with it’s location between the Kawartha Lakes and Lake Simcoe it’s easily accessible; Lock 43—Swift Rapids which is the longest lift or drop at 47 feet; and the Big Chute Marine Railway at Lock 44 which is the only one of its kind anywhere in North America. If ever there was a year to check it out, 2017 is it! 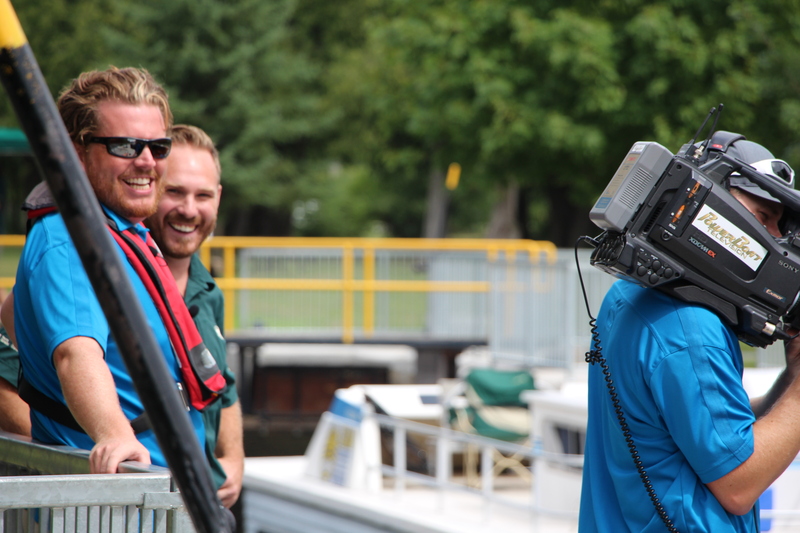 Sure, you won’t be the only one, but boating has always been about community and Parks Canada and the Trent are ready to meet all of us this summer. See you out there! 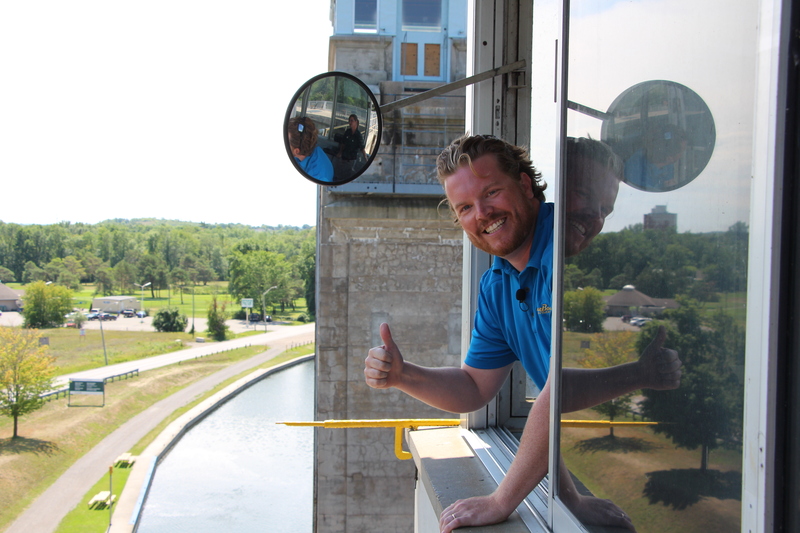 Believe it or not, they let me drive the Lift Lock! Entering the top of the Lift Lock is a thrill unto itself. 65 feet in the air and you may have to go right up to the very front! 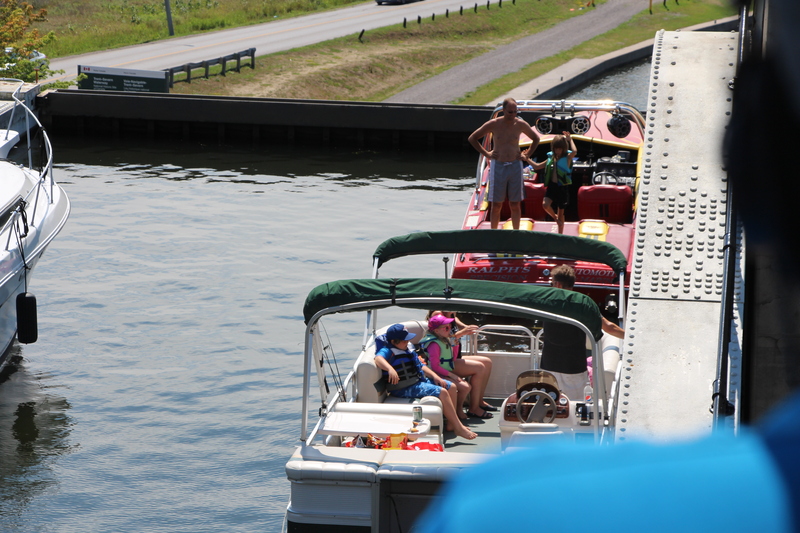 Giving the boaters riding the Lift Lock a few fun facts about the incredible history they are experiencing. Our oTENTik at Lock 24. 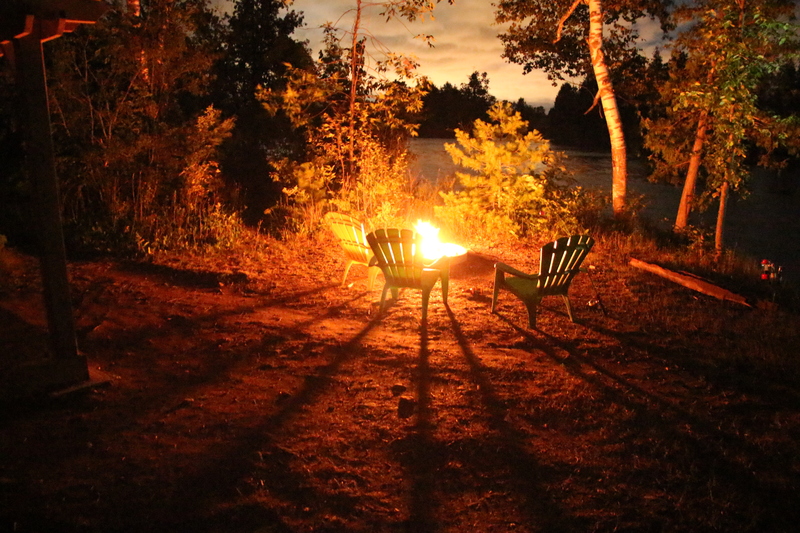 More rugged than a hotel room but more luxurious than a tent. The Trent really is for everyone. From canoes to cruisers to houseboats and everything in between. This article was featured in the Spring 2017 issue of Boats&Places and episode 5 of the 2017 season of PowerBoat Television. 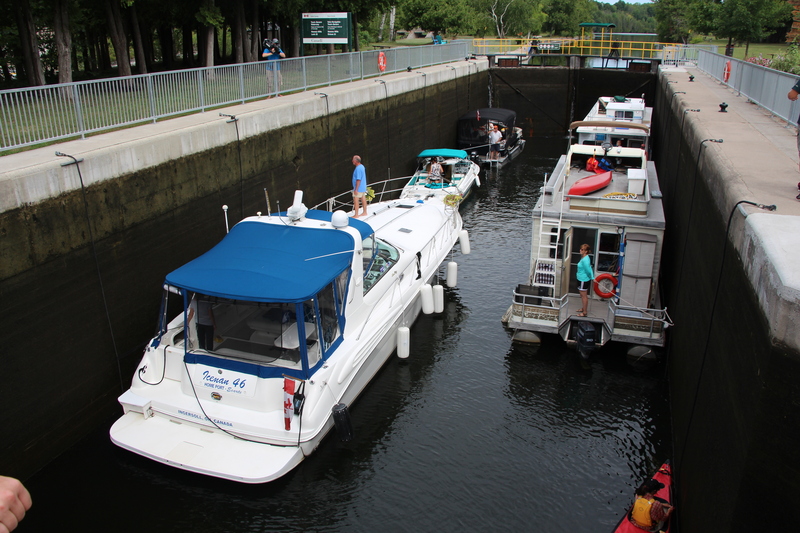 Watch an extended, exclusive, all-access tour inside and underneath the historic Peterborough Lift Lock along the Trent-Severn Waterway.